Children, adults, and a Northwest Airlines Boeing 707 jetliner on the tarmac at General Mitchell International Airport. 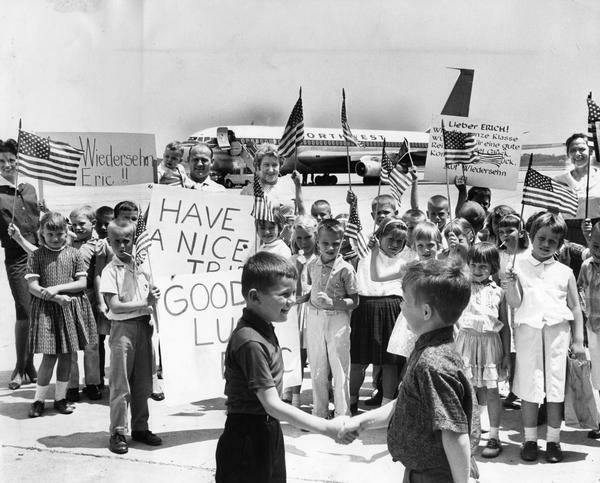 The children, all first graders from Happy Hollow School, were on a field trip to say farewell to a classmate who was about to depart with his mother to visit relatives in West Germany. Milwaukee had entered the jet age only two years earlier with the arrival of a Northwest Airlines Boeing 720.